I’m not what you would call a car aficionado, but cars run in my family. My dad was an autoworker for 35 years in Spain and I married the daughter of a retired GM autoworker who also collects classic cars, like this old Ford for example. 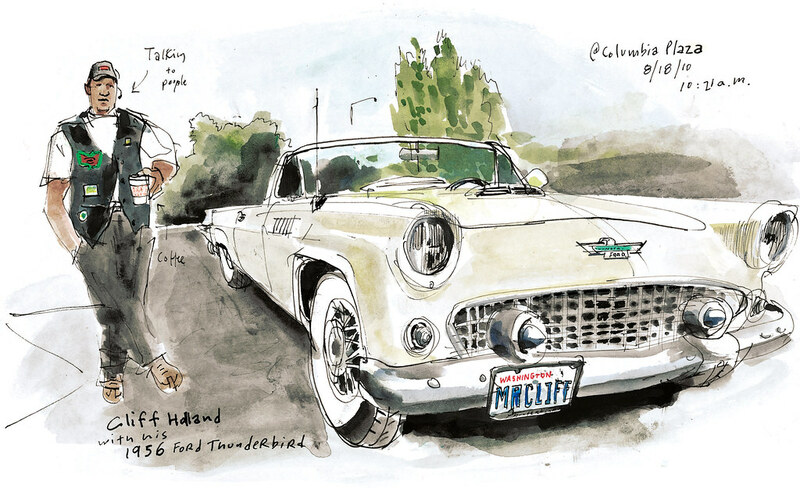 I thought of both of them this week as I sketched members of Old Rides Seattle, a car club started by Central Area automobile enthusiasts in 1972. Henry Nelson of Beacon Hill, also a GM retiree like my father-in-law, has a long resume in the automotive industry. He worked as a sales manager overseeing all Chevy dealerships in Washington, Oregon, Idaho and Alaska and was the head of the Department of Automotive and Diesel Technology at South Seattle Community College. 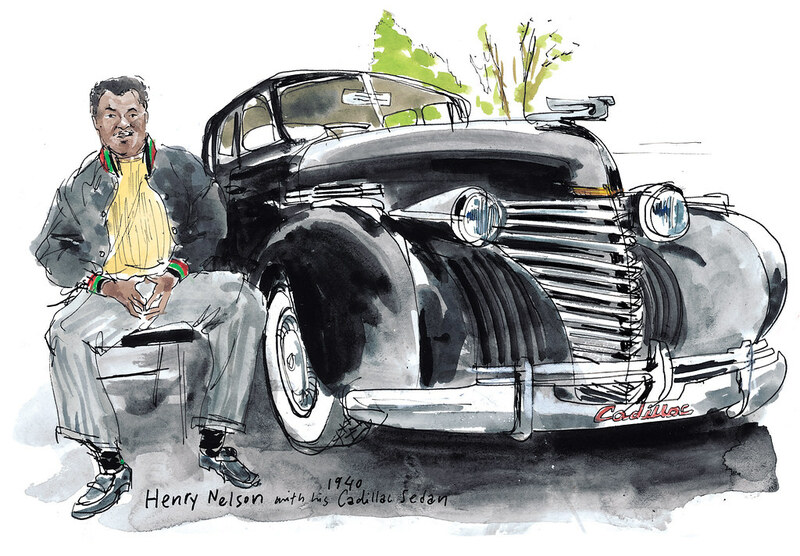 Nelson is also one of the founding members of Old Rides, “the longest-running predominantly African American car club north of Los Angeles,” he said. Nelson warns that car collecting is an expensive hobby. He even bought the house next to his to expand his garage, which also includes the first car he ever owned, a 1950 Ford Custom that is currently in the shop being rebuilt. Clifford Holland, also of Beacon Hill, retired in 2003 and joined the car club in 2005. He was a store manager at Safeway, where he worked for 38 years. He purchased his 1956 Ford Thunderbird in 1982, when it was already starting to become a collector’s model. It’s the car he always wanted since he was 15, but wasn’t able to afford until his mid 30s. He said the frame, engine and interior were restored to get the automobile back to the original specs, a process that took a year and a half. For Holland, “it’s a sense of pride when you have a very nice-looking automobile.” He is currently serving as president of the car club. Friday I’ll introduce you to another member of Old Rides Seattle, Valerie Pipkin, of South Seattle. She likes classic cars because they look like “rolling pieces of art.” That’s exactly why I enjoy drawing them. This Sunday you can see more than 150 classic cars as Old Rides Seattle hosts their second annual Columbia City Classic at Columbia Plaza from 8 a.m. to 4 p.m. For more information visit www.oldridescarclub.com.